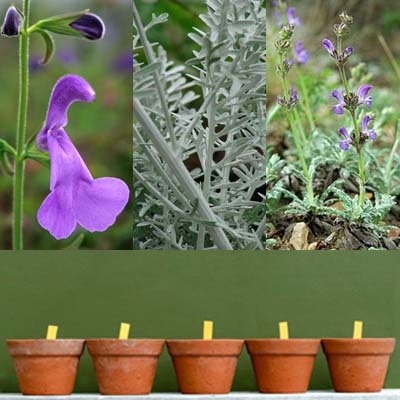 I want to grow Salvias and companion plants in containers. What kinds are good for potting? The Salvia genus is huge. It contains about 900 species, many of which are excellent choices for container planting. For example, almost all the annual and tender perennial choices in our catalog are easy-to-grow choices for potting. When reading a plant description in our online catalog, open its Cultural Icons tab above the photo. This leads you to a page detailing plant characteristics and optimum growing conditions. If the plant is a good choice for container gardening, you'll see a potted plant icon in the section titled Garden Uses. Just because a plant is short doesn't necessarily mean that it grows well in a planter. Conversely, a number of our plants that are tall and wide in the ground adapt well to life in large planters. For example, here is an unexpected yet handsome combo of short and tall plants: The purple flowered Caucasus Sage (Salvia canescens var. daghestanica) -- 12 inches tall and wide in bloom -- and Velvet Centaurea (Centaurea gymnocarpa), which has lavender, thistle-like flowers and is 60 inches tall and wide in bloom. Although their bloom times don't match up until fall, they both have silvery foliage that lends a glow to your patio on moonlit nights throughout the growing season. Another cool colored combination involves Gentian Sages, which are popular container gardening choices. They seldom get bigger than Giant Gentian Sage (S. patens 'De flores gigantes'), which is 48 inches tall and 24 inches wide in bloom. Put it together with the petite Dorset Lavender Gentian Sage (S. patens 'Chilcombe') for purple punch. Keep in mind that the limitations of container growing may cause plants to achieve smaller sizes than they would in the ground. When combining plants in pots, make sure that their cultural needs for sun exposure, water and soil are good matches and that at least part of their bloom season overlaps. Another tip to remember is that even xeric plants such as Caucasus Sage and Velvet Centaurea need regular watering in containers. No matter how drought-resistant plants are, large ones are thirsty when grown in pots. Gravel mulch can help retain moisture. Container gardening is an age-old solution for adding greenery to small spaces and areas where soil is dry and compacted. They add visual appeal to balconies, entryways and patios as well as amid flowerbeds. So go for it. Look for the potted plant icon in our plant descriptions; compare cultural requirements; experiment with combinations and have fun. If you need any advice, please call us or send an email.